Amaravati Publications is the publishing imprint representing both Amaravati and Cittaviveka (Chithurst) monasteries, focusing on Dhamma-material produced by sangha members associated with those communities. Everything published by Amaravati Publications is for free distribution. Currently available books can be found in our ebook section. Printed books can be picked up at the monastery, by the Sala entrance (see the monastery site map). Talks published by Amaravati can be found in the audio section of this site. Amaravati publishes a quarterly newsletter, Looking Ahead, which contains news and announcements concerning the monastery, an events calendar and the Retreat Centre schedule. Some audio and printed materials published by the monasteries can be sent by mail: audio and books. 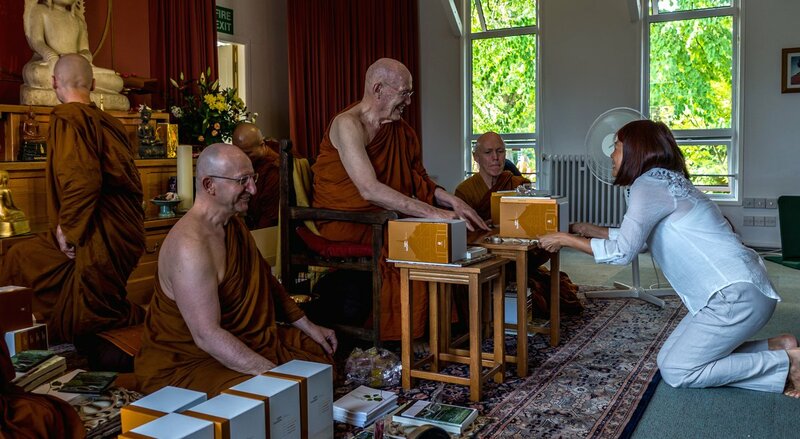 We aim to make the teachings of our sangha freely available via publications. If you would like to support this endeavour by offering a donation, kindly use the button below. If you would like to offer to transcribe, edit or proofread material, or wish to help with typesetting and design, etc., please contact Amaravati Publications by completing the form at the bottom of this page. Thank you. If you wish to contribute towards the reprinting of a particular book listed amongst the Amaravati Publications titles, information about this can be obtained from the Publications Secretary using the ‘Contact Amaravati Publications’ button below. You may, for example, like to sponsor the reprint of a book that has been especially helpful to you; or to make a contribution towards the reprinting of one of the perennially popular Amaravati Publications titles, such as Mindfulness – The Path to the Deathless or Introduction to Insight or The Four Noble Truths. A full list of such titles can be obtained from the Publication Secretary.